Art Heart Sculpture gift is one in a curated collection of hearts to celebrate occasions, relationships, love, joy, and life. 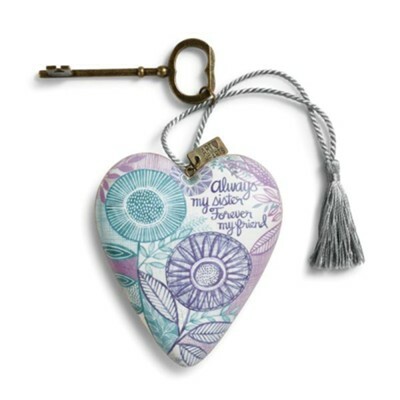 Heart is artistically detailed and finished with a metal key and luxurious tassel. Artful graphics, gift for sister; shades of blue, aqua, purple. The heart may be hung up, or using the key in the keyhole on the back of the heart, it can be displayed on shelf or table. Crafted of resin; 4" ; heart is ready to give, in gold-foiled gift packaging. Expressive art heart makes a unique and meaningful gift. Always my sister. Forever my friend. I'm the author/artist and I want to review Always My Sister, Art Heart.